MANA is seeking input from the community on ideas to re-purpose current and future vacant lots on Scott Circle between Medlock Park and Willivee Rd. These properties are or will be owned by the County, and as they lie in a flood plain there are limited options for their use. MANA is putting together a committee to work with the county, Druid Hills Youth Sports (who also serve as the Friends of Medlock Park) and Park Pride to develop ideas and plans for re-purposing these lots into viable greenspace. The process will take many months and we would like to have a lot of active participation by the neighborhood. Medlock Park and surrounding area. 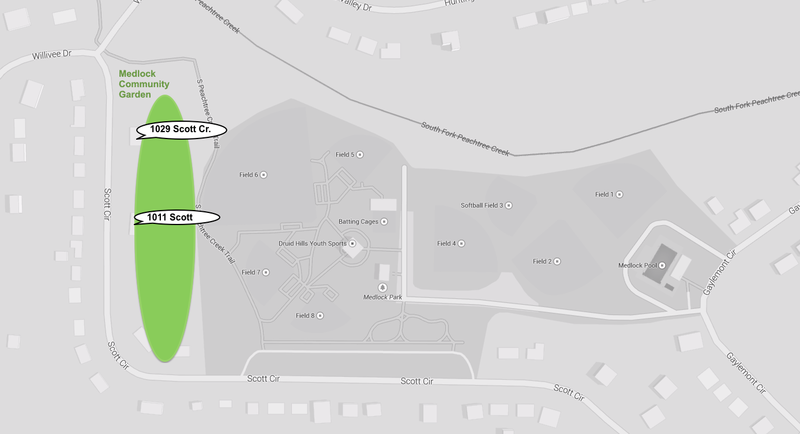 The green oval marks the location of current/future vacant lots. The Medlock Community Garden is already located at the corner of Scott and Willivee. Soon-to-be demolished properties are marked (1011 and 1029 Scott Cr.). If you are interested in joining the committee and/or have ideas, please contact Casey Boudreau: csybdr at yahoo dot com. Thank you in advance for your support to maintain and improve our greenspace! Related: at last evening's Community Meeting, Dave Butler (Greenspace Environmental Manager with DeKalb County) informed us that the properties at 1029 and 1011 Scott Circle have been purchased by the County and will be demolished in the coming weeks. But, before that happens (and as is often done with such properties), the Fire Department will use the structures to conduct training next week.